Bangalore, July 17 2018: Once again a student of BASE brings outstanding result by topping the charts in Karnataka state in the BSc BEd CBZ stream (Bachelor of Science in Chemistry, Botany, Zoology) of Regional Institute of Education Entrance Exam (RIE) 2018. 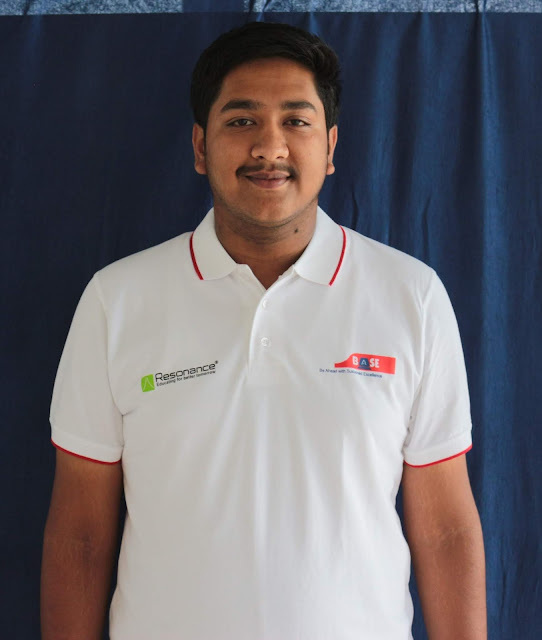 Shashank Rao, a student of Jnanada Integrated PU Science College (A BASE managed College) had also excelled in his 2nd Year PU Board Exam scoring a centum in Physics. The Regional Institute of Education (RIE, formerly known as Regional College of Education), is a constituent unit of the National Council of Educational Research and Training (NCERT), New Delhi. “I would like to acknowledge the immense support and encouragement from my parents, which motivated me to work hard and achieve this position. The teachers at our college were very supportive and continuously encouraged me to push my boundaries. I thank each one of them whole-heartedly!”, said Shashank Rao. The RIEs were set up in 1963 by the Government in different parts of India, covering various regions. The Regional Institutes were started with the objective of qualitative improvement of school education through innovative pre-service and in-service teacher education programmes and relevant research, development and extension activities. The Regional Institutes of Education have established themselves as institutes of repute in the area of school and teacher education. The Regional Institutes of Education (RIEs) are located at Ajmer, Bhopal, Bhubaneswar, Shillong and Mysore.